Sharon is married to Tim and together they have two sons, Josh and Jacob, and two beautiful daughers-in-law, Priscilla and Kara. 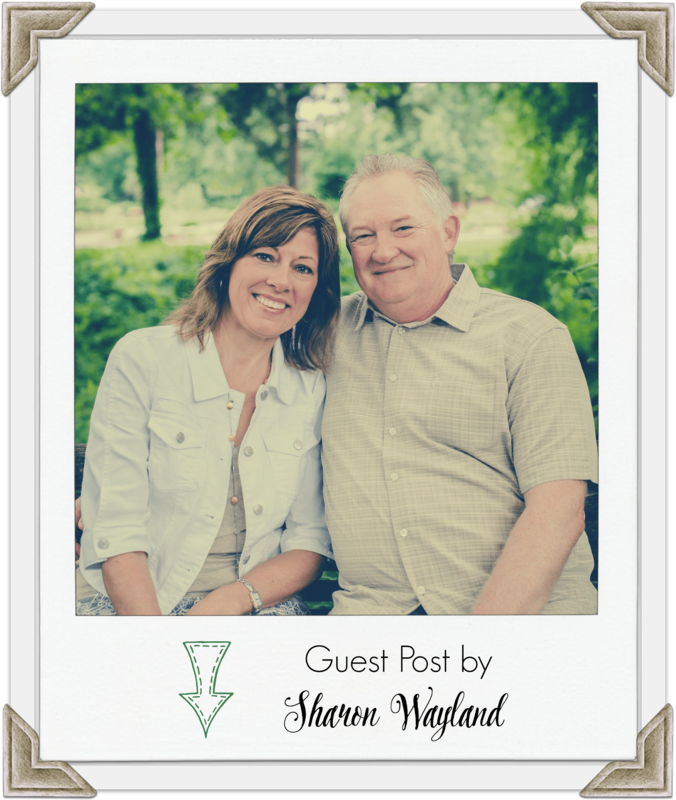 When she’s not doing accounting work or serving in the church with Tim (an elder) you can probably find Sharon loving on her two sweet grandsons, taking pictures, spending time with family and friends, or collecting stamps in her passport with her husband. This is the third year for our Kindred Hearts program. I certainly don’t feel like an older woman but I do have grown children and grandchildren, so I guess I now qualify. Our program started as the result of some of the younger women desiring a relationship with older women. Some had experienced a mentoring group at a previous congregation. 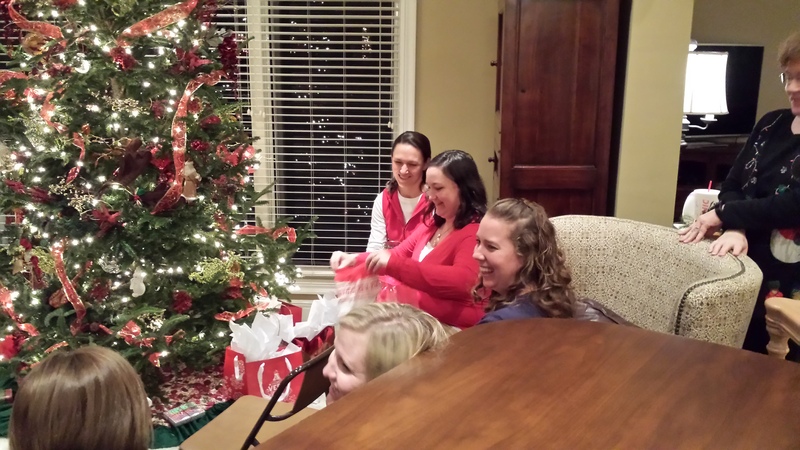 We gathered a committee of ladies together, including a couple of young ladies that had been involved in the program. I feel like the name “Kindred Hearts” truly reflects how we should feel as sisters in Christ. Titus 2:3-5 (referenced above) became the cornerstone of our program. 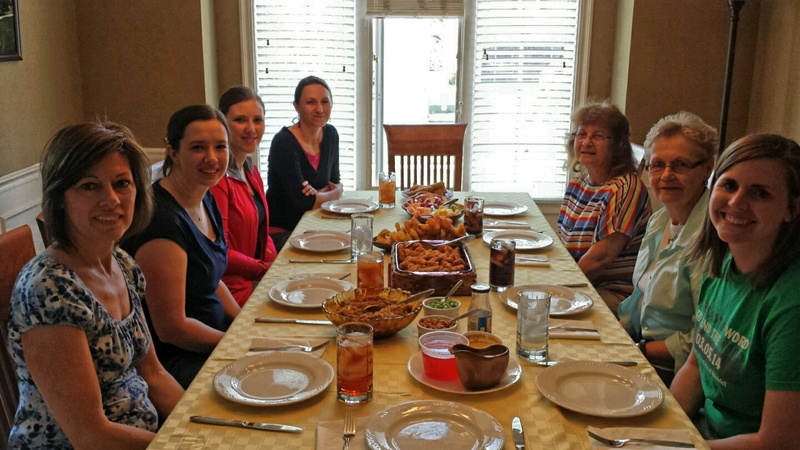 The Naomis (typically older women with grown children) host the Ruths (younger women) in their homes once per month with dinner and a short devotional. In fairness to all attending, no children (including babies) are allowed to attend so that all women enjoy meaningful conversation and time away from their hectic schedules. We have a wonderful group of husbands at our congregation that watch the kids while their wives enjoy an evening of Christian fellowship. And even though this program was designed as a way to help the younger ladies learn from the older ladies, I will say that I have learned so much from the young ladies in our congregation. The best part of this program is that it builds relationships as we help each other grow closer to God and encourage each other. 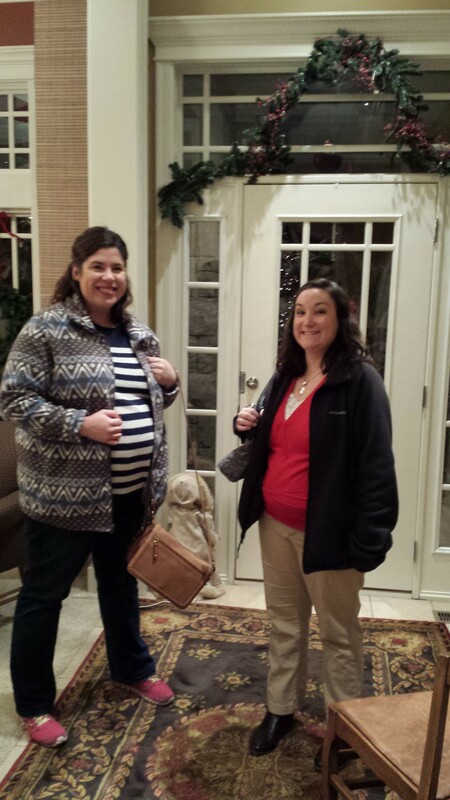 Me (being all super pregnant) with my friend Tracy at the Kindred Hearts joint Christmas party. I was only able to participate in Kindred Hearts for the year we were living in Kansas, but it was so wonderful and I look forward to the day I can participate in it again. I think especially as the new kid on the block it was a great, laid back, informal way to get to know a few ladies, both my age and a little older. I cherished those Monday evenings once a month with those other ladies. We shared wedding stories and photos, recipes, prayed together, carpooled together, gave and received new mom advice, and ate. Oh, boy, did we eat. Not having having my own momma nearby (as I was becoming a mother myself), those evenings spent having a home cooked meal, being prayed for, gleaning advice, and just plain old having a fun time with my Naomis were a gift. With eight(ish) ladies per group, there’s pretty good opportunity to create a selection of various backgrounds- widows, single moms, newlyweds, married many years, new moms, moms-to-be, working moms, stay-at-home-moms, new Christians, mature Christians…and the list could go on. You can build your group however it can serve best. I think many women in the church can struggle with feeling like they don’t have a place to contribute to the body. 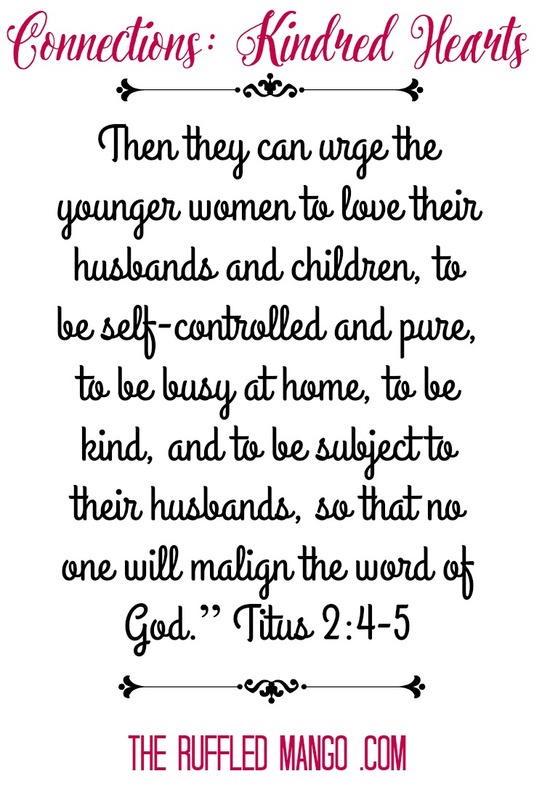 This is such a good way, especially for the older ladies, to serve-by teaching the younger ones. Sounds pretty biblical, right? As one of the Ruths, it was such a learning experience, to be served (quite literally) by our Naomis. They did everything for us. The Naomis planned the evening, hosted, prepared all the food, and completely doted on us. Y’all, they wouldn’t even let us refill our own drink. And then on top of everything, they had cleanup duty, too! As my friend Tracy pointed out, it can be difficult to sit back and let the older ladies do all of the work. After all, often times they’ve been at work all day or taking care of their own families. 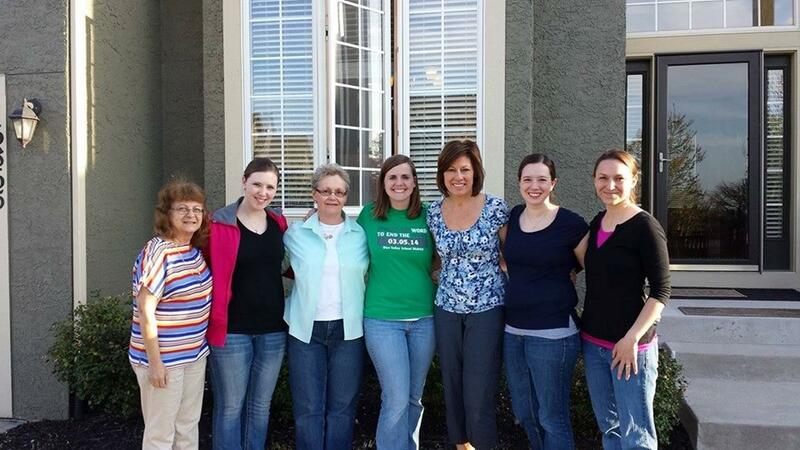 But as with other areas of service in the church, this is a time to allow these ladies to serve God by serving others. Ladies…if your congregation doesn’t already have a program like this, you need to get one started! This is the perfect time to speak with your church leaders and start planning for a September start date. Sharon has been kind enough to share a few of the forms that they have used for their Kindred Hearts program. Feel free to give them a look or download for your own KH program.